Hey Aspiring Online Money Maker! I’m very glad that you’ve decided to check out my free step-by-step earn money online guide! Hopefully you will find this guide helpful and will also find the answers to the questions you have regarding making money online. I believe this is going to help you get started the right way in the online business world. Any More Questions? I’ll Help You! 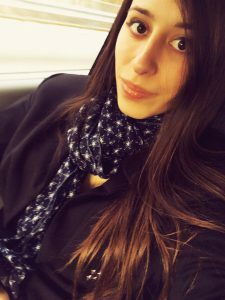 My name is Miren and I got started in the online money-making world back in 2015. After dropping out of college in late 2014, I didn’t really know what to do with my life. After that, I started an International Commerce training that lasted less than 2 years. Right then, I thought that the only possibilities I had were to start another college degree or look for a job. But one day while I was on a break, someone told me about a conference about the successful mindset and assisted because I was eager to learn. Thanks to that conference, I met people who introduced me to the MLM world and that’s when I started searching if it was true that it was possible to earn a living online. I first got attracted to paid surveys because I loved answering questions but I almost fell for a low-quality/scam program that promised I would earn thousands of dollars per week. Luckily, I did not fall for it because I did my research and found out a lot of people had got scammed, which got me kind of upset about this whole “make money online” world. I realized that taking paid surveys was time-consuming and not the best way to make a full-time income because companies don’t pay that much per survey completed, so I kept on searching for other ways of earning money, until I heard of dropshipping and tried it. I made money dropshipping but didn’t like the fact that I had to constantly search for products to sell (I didn’t earn that much per each product sold) and also had to deal with refunds. What I knew for sure is that I wanted to find something that would give me freedom. Freedom to work from wherever I wanted like my home or while being on vacation. Freedom to work whenever I wanted. And I also wanted to build residual income streams because I didn’t like the idea of having to be active all the time just to make money. After a lot of frustration and confusion, I came across something that seemed it would make possible all that I desired. I must say that I was very skeptical at first because of the many scams I had encountered, but I gave it a try and it’s one of the best decisions I’ve ever made. I’m very grateful that I finally found what I had been looking for. Maybe your situation is different from mine. You might be older or younger than me, you might live in a different country and you might have different goals, but we’re both focused on the same thing… which is earning money online. That’s why I have decided to create this free step-by-step earn money online guide. I have learned a lot since I got started and I want to share my knowledge to point you out in the right direction. I believe I can help you build your very own online business that will allow you to make a full-time income online. A sustainable online business that will be based on something you’re passionate about and will help you make your dreams come true. Scammers take advantage of the fact that a lot of people are tired of their jobs or struggling financially. There are many get-rich-quick schemes and scam products that want people to believe it’s possible to earn money immediately or without doing much work. Just because everything on the Internet seems to happen very fast, it doesn’t mean that making money is fast too. For example, when you want to reach out to someone, sending a message is fast so most people are used to things happening almost instantly. This is one of the reasons why there are people who think that making money online is kind of magical or that it can happen quickly. But the truth is that earning money online is not faster than doing it offline. There’s no “push button system” or “a few clicks program” that works so never believe someone who tells you that you can make money online without putting in the effort. If systems like that really worked, then we all would be rich already, and there wouldn’t be people like you looking how to make money online. You will never hear me say that you can earn thousands of dollars per day without working. This is just like anything you want to accomplish in life. For example, if you’re an athlete and want to win a race, you cannot expect to win if you hardly ever do workouts. 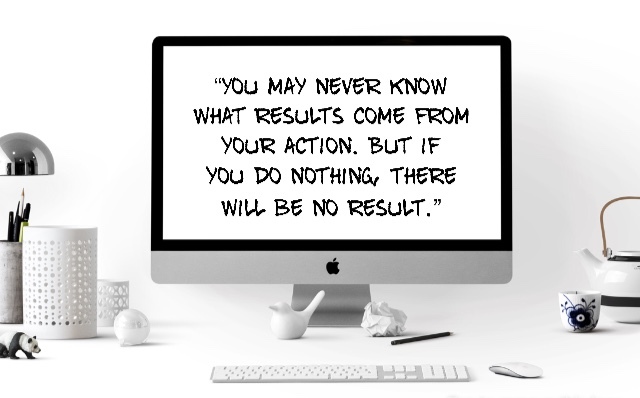 The same happens when it comes to building an online business. If you don’t put any effort into it, you will not earn anything. You will reap the rewards you sow, this is very true for this online business model I will show you. The more effort you can put into it, the more results and income you will enjoy down the road. Anything worth achieving in life takes both time and effort, so if you are willing to invest in your business, your business will return to you in so many ways. There are many ways to make a full-time income online, but after trying many methods I concluded that this one I’m about to explain is the best to me. First of all, you build a website (don’t worry, this doesn’t require you to have any technical skills) about something you’re passionate about. For example, let’s say that you love babies and you decide to write useful content about babies. One day you can write a post about organizing a baby shower where you include a list of ideas and items concerning decorations and ornaments. After having posted the article, you will get it ranked on search engines like Google, Yahoo and Bing. When people search for ideas for a baby shower, they will see your website and click on it to read the post. Your visitors will be happy to have found what they had been looking for and will end up clicking one your links about baby shower decorations. The thing is, you can do this multiple times to make more and more money. You can write lots of articles that contain links to products you can make money from. As an affiliate marketer, you don’t need to create your own products. You will be promoting other people’s products instead. There are lots of companies like eBay, Apple, Amazon and Walmart that have affiliate programs, which are free to sign up. After joining an affiliate program, you will be able to promote the company’s products/services with the affiliate links they give you. And then, when people click on your affiliate links, they will be taken to the products page and you will make a commission when they buy a product. There are literally millions and millions of products you can promote and make money from. For example, big companies like Amazon and eBay sell products from all categories so there’s a lot to choose! In my opinion, it’s best to choose a category of products you are interested in or use yourself because this way you can tell your personal experience when you’re promoting it. I personally like to try the products/services before promoting them to make sure they’re useful and valuable. But I know not everyone purchases the products they want to promote, it’s really up to each person and their values. You know the typical car salesman, right? Well, the good news is that you don’t need to be good at sales to make money as an affiliate marketer and you will not need to talk on the phone with anyone. The truth is that this doesn’t require you to “sell” anything. I’ve been able to make money without being good at selling so if I have done it, anyone can do it too. What you really have to do is to help other people by recommending them products or services that can meet their needs or help them fix a problem. Therefore, the way to be a good affiliate marketer and build a long-term profitable business is to help others because this way you will gain trust. If your visitors trust you, they will believe that the products/services you recommend can really help them so they will end up purchasing them. That’s why it’s so important that you focus on helping people instead of just making money. This is the way to go if you’re in this for the long run. Another reason why many people don’t get started is because they think they need to be an expert at something. I remember believing that when I was starting out. But the truth is that you don’t need to be an expert at something in order to write about it. There are things I’ve written about without knowing anything of prior. I just did some research to find the information I was looking for, then I wrote the post, got it ranked on the search engines and so on. There are many people doing this too. What really matters here is that you are passionate about the topic you choose (your niche) because you will need to keep learning about it in order to be on top of things. Do you know how many people are searching on the Internet every single day?? See it in the graphic below! Over 3 billion people and growing each year! Crazy, right? And the more people you help, the more money you can earn. 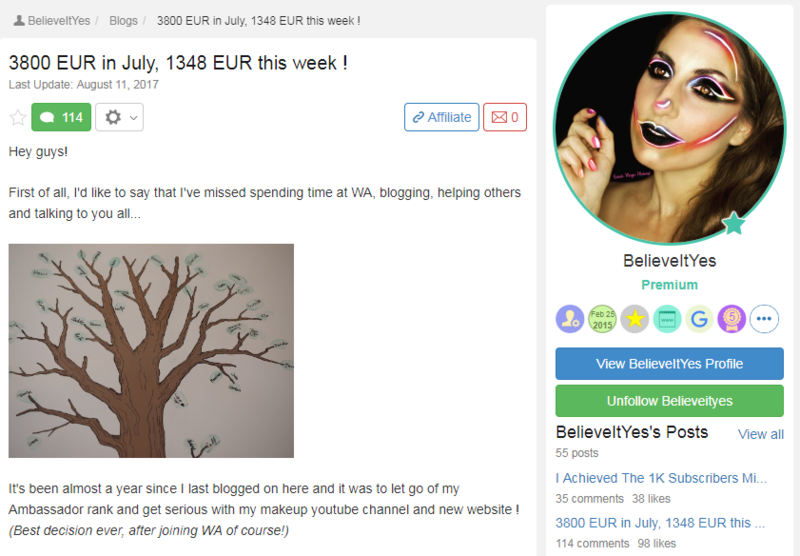 The best thing is that you don’t need to be active all the time to help people and make money, you can write a post that gets good rankings, get thousands of visitors to that post and profit over and over again when they buy the products and services you recommend. Doesn’t it sound amazing to get paid over and over again for something you did once? So imagine if you write a hundred posts or more, your website will get more visitors which means more traffic and more money! 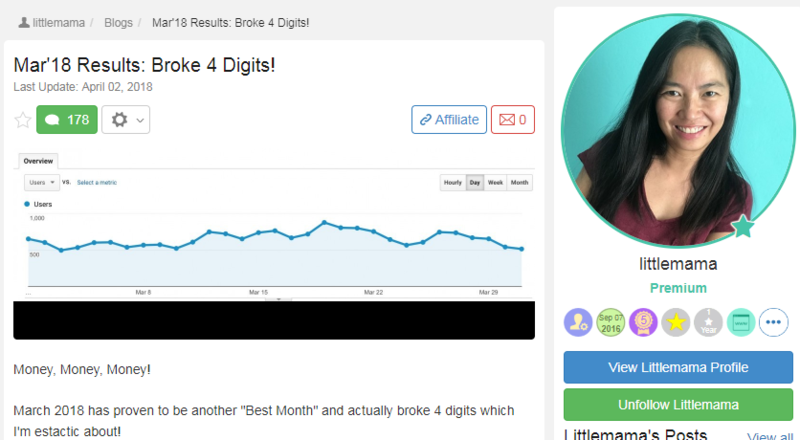 We can recap the process of earning money through affiliate marketing in 4 simple steps. Choose a topic you are passionate about or have an interest in. I recommend that you choose something you have a passion for instead of what you think that will make you the most money. I mean, if you choose something you’re not passionate about you might eventually get bored and end up quitting. Build a website. The website you’ll build will be about the topic you’ve previously chosen. This is easier than you may think because it doesn’t require you to have any technical or coding skills. The place I will show you has an easy-to-use website builder that will enable you to build at least 2 FREE websites in a matter of minutes. Attract visitors to your website. You will provide helpful articles (with affiliate links included) to your audience, which will get ranked on the search engines and drive visitors to your website. The best part is, you will not have to pay a dime to get visitors and there’s no limit when it comes to the amount of people that visit your website! Here comes the most interesting part! 🙂 Let’s see the platform where you can find all the training and resources needed to build a successful affiliate marketing business. I remember finding this platform back in November 2015 but I didn’t join until March 2016. I had come across many scams so I was skeptical and frustrated, that’s why I did a lot of research before joining this platform I’m going to introduce you to. And now I can say that I’m very glad that I gave it a try. So what’s this platform’s name? Wealthy Affiliate. 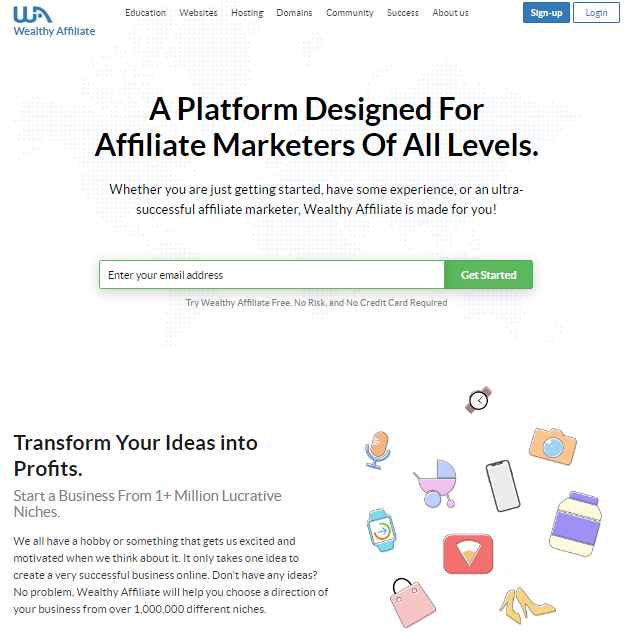 Wealthy Affiliate is an online training platform that provides step-by-step training, easy-to-use tools and support that help people start affiliate marketing businesses from scratch and take them to any level of success they want. I remember I got impressed after joining. English is not even my first language so I thought I would get easily lost, but they showed me what to do step-by-step so I didn’t get lost and understood what to do next. I had never seen a platform or program this well-structured and organized. I felt like I had finally found what I was looking for! Also, I got amazed at how supportive the owners and the other members were. There was always someone who replied to the questions I had. I had not been in a community like this before! The training is also great because they teach you how to get started from zero. They walk you through the process of choosing a niche, building your website, creating content, finding products to promote, getting your website ranked in the search engines… everything to finally make passive income online! Wealthy Affiliate includes tools, training, support… It’s an “all-in-one” kind of platform. Here you will find everything you need to build an affiliate marketing business from scratch! *I want to be completely transparent with you. If you sign up to Wealthy Affiliate through any of the links from this guide, I will get compensated. But I will do my best to help you out because I really appreciate your support and I believe in you. There’s so much to say about Wealthy Affiliate, I could talk about it all day long and still forget something lol. That’s why I’m going to go over the most important stuff. SiteManager. 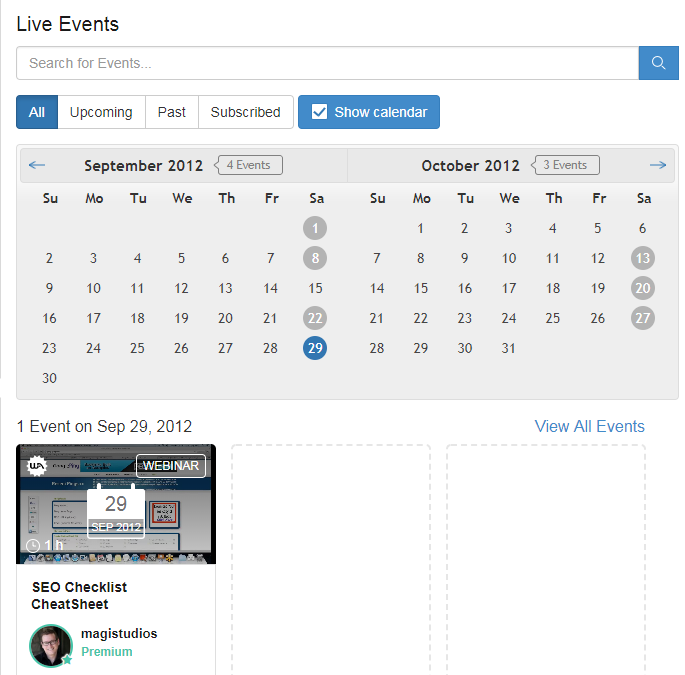 With SiteManager, you can access your website/s in a matter of seconds. It also includes SiteEmails, an easy-to-use tool that allows you to create email addresses for your domains. 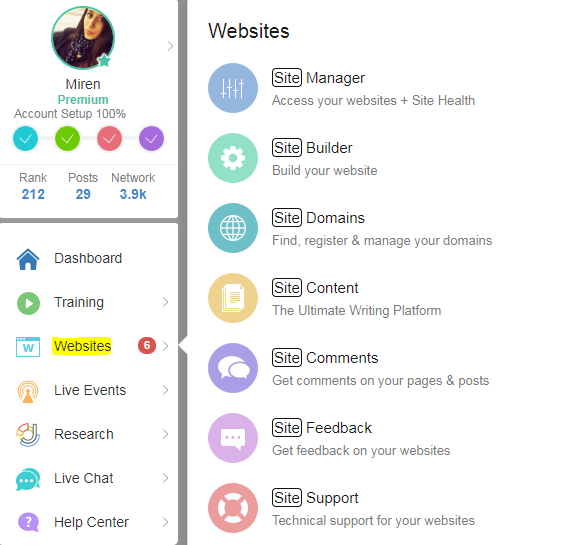 SiteBuilder. Remember that I told you that you can build websites easily? 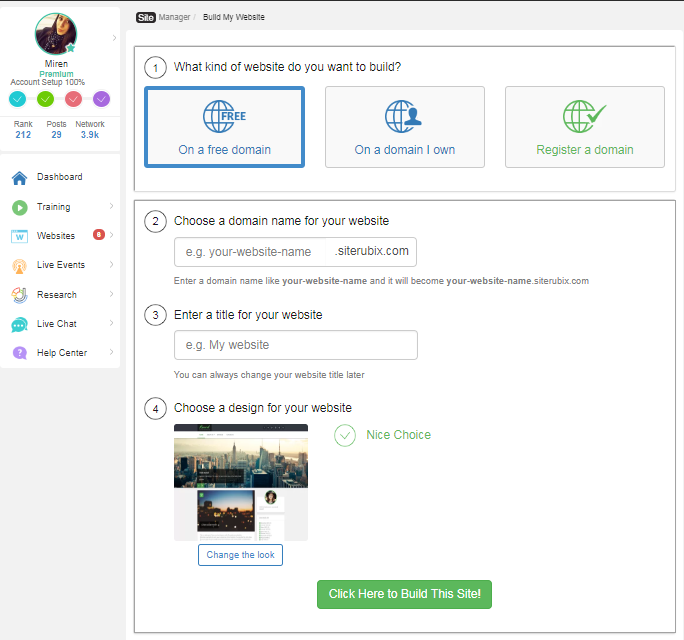 SiteBuilder will let you build your website in a matter of minutes (not to say seconds). SiteDomains. Here you can search for domains to purchase. They cost $13.99 – $15.99 per year. SiteContent. This one is great to write posts and publish them on your website, it includes a grammar check and millions of pictures to choose from to include on your posts. SiteComments. Tool that allows you to post comments on other websites and get comments on yours. SiteFeedback. Want to know what other people think of your website and what you can improve? SiteFeedback will help you with this. SiteSupport. Whenever you have an issue with your website, you can send a ticket to SiteSupport and will receive a reply soon. In my case, sometimes I’ve got a reply in 10 minutes or less! Want to see how easy it is to build a free website? Let me show you the steps to take. Amazing, right? If you already have a name for your website, you can enter it below to build your website now! Wealthy Affiliate’s website hosting is highly secured and safe, so websites rarely suffer cyber attacks. The engine behind all websites hosted at Wealthy Affiliate is WordPress, which you may have already heard of. 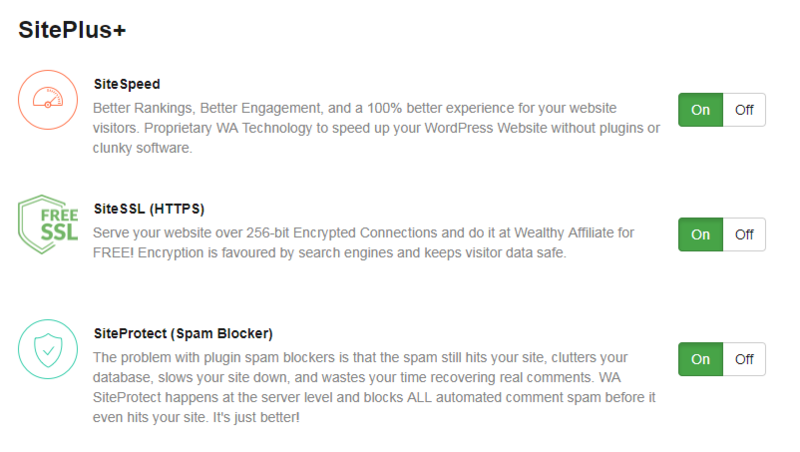 Wealthy Affiliate’s hosting plaform also includes features like SiteSpeed that will speed up your sites, SiteSSL that wil keep your visitor’s data safe and SiteProtect that blocks spam. When it comes to websites backups, you can rest assured knowing that your site/s will be automatically backed up. Wealthy Affiliate offers many options to get your own website hosted on WA’s powerful hosting platform. If you already have your own domain that you’ve bought somewhere else, you can easily transfer it to WA and host it on WA’s hosting platform. Apart from it, you can also transfer your free website to your own domain inside Wealthy Affiliate. Inside Wealthy Affiliate, you will find a keyword research tool, which is essential to find good keywords for your posts and get them ranked on Google. This keyword tool will enable you to find what people are searching for, how many people are searching for it and more. After signing up, the training course that will get you started is called Online Entrepreneur Certification course. These lessons are very easy to follow because Kyle, one of the owners of Wealthy Affiliate, shows you what to do in the training videos. It’s almost impossible that you get lost because at the end of each lesson there’s a list of tasks to complete, and you can always go to the previous lesson if you want to check out what you’ve already done. Another thing is, I recommend that you don’t skip any lessons because there are tasks that need to get done before others in order to to build your business properly. In case you get lost somewhere in the lesson or there’s something you don’t understand, there’s a discussion area where you can post your questions and comments to get help. GET THE FIRST 10 LESSONS FOR FREE HERE! Apart from the Online Entrepreneur Certification course, there’s more training, tutorials and videos. Another popular course that you can find inside Wealthy Affiliate is the Affiliate Bootcamp course, which teaches you to build an online business around the Wealthy Affiliate’s affiliate program. To add to it all, Wealthy Affiliate also provides weekly live training classes that you can watch as many times as you want. There are still available live webinars that took place in 2012 (example below) so there are already more than 200 “WAbinars” to watch and learn from. These live webinars are amazing because you can ask questions to the person who hosts these webinars (usually Jay but Kyle has also hosted some webinars). Depending on your time zone, you might not be able to attend these webinars but no need to worry because they’re already available the following day. Wealthy Affiliate has a big community with over a million of members, which means that there are thousands of active bloggers & Internet entrepreneurs to interact with. Jump on the live chat to get instant help. In case you have an issue or don’t understand something, you can use “ask a question” to get replies and opinions. Create a training course/tutorial/video to help other members. You can earn credits if the training is useful for other members. 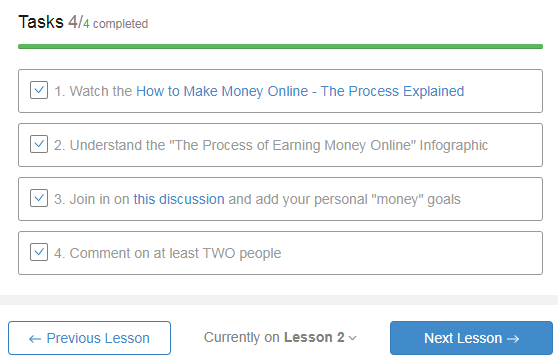 Ask questions or post comments in the discussion area below each lesson. Post a comment on any member’s profile, the owners included! Send a private message to the owners or any member. Send a ticket to SiteSupport if you have any technical questions about your website/s. I’ve personally never seen anything like Wealthy Affiliate, I’ve never heard of any other platform that has these many tools, support and training! Wealthy Affiliate has two memberships: Starter Membership (absolutely FREE) and Premium Membership. The Starter membership is not a free trial and doesn’t require you to provide any credit card information to get started, which means that you can join for free and stay a free member for as long or as little as you want. I personally recommend that you get started with the Starter Membership because you can see everything for yourself without spending a penny. I love the fact that they allow you to test out the platform without asking for your financial information. Most programs out there don’t let you test it all out for free, and some offer a free trial but also ask for your credit card information. The Premium Membership basically includes everything you need to build a successful affiliate marketing business. 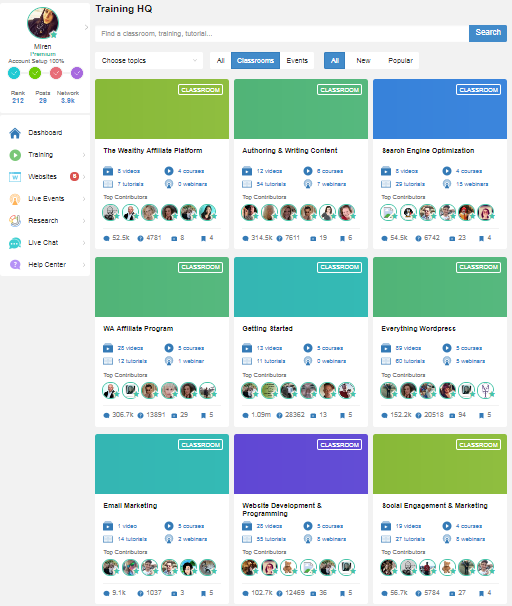 It gives you access to all training, all tools and support. It’s an “all-in-one” package! I love the fact that Wealthy Affiliate is completely transparent when it comes to what you’re getting and the cost of it. I mean, there are many programs and products out there that have expensive upsells and don’t contain everything you need to succeed. When it comes to the cost, the normal cost is $49/month but you can get a 61% discount for the first month (only $19) if you join using the button below. Another yearly cost is your own domain for your website, which costs $13.99-$15.99 per year. At this point, you might be skeptical and may think that Wealthy Affiliate is too good to be true because it offers so much at such a low cost. I know it’s easy to wonder if this is just another scam designed to take your money, especially if you have been scammed multiple times. Even though I had not fallen for a big scam, I remember being skeptical the first time I came across Wealthy Affiliate, since I had read many comments and complaints from people who had got scammed by other programs. I’m not going to say that Wealthy Affiliate is not a scam because it’s free to join, since there are scam websites that are free to join too. There are other reasons why Wealthy Affiliate is a legitimate and authentic company. 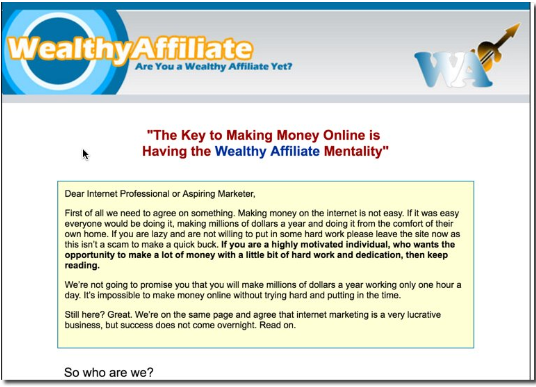 To begin with, we get to know the co-founders of Wealthy Affiliate and it’s been proven that they are real people like you and I. I review many “make money online” products/websites and it turns out that scammers usually hide their real identities. If you have read one of my reviews, you might be aware of it. Kyle and Carson are transparent and caring people who really want to see their students succeed. They’re on the platform everyday to interact with members, to answer questions, to solve any issues within the platform… They spend vast amounts of time on the platform helping people start and grow their businesses. Most scam websites and low-quality products don’t last long because they get reported and shut down as a result of not providing value to the market. In this case, Wealthy Affiliate has bee around for more than 12 years already, which tells us a lot about its legitimacy. Another thing I like is the fact that Kyle or Carson don’t make falses promises to their students and don’t brag about their lifestyle or their income. They’re not the kind of people who show pictures about a lavish lifestyle. As I said before, they’re straightforward and honest with WA members and will tell you what you need to hear instead of what you want to hear. See this blog Kyle wrote a while ago, where he talks about what it takes to build a successful online business: If I Work at This 8 Hours Per Day. I’ve seen other training platforms that have outdated training, which is a problem because some methods that used to work some years ago no longer work. Well, the good news is that Wealthy Affiliate always has the training updated and tools improved. I remember how it looked when I signed up back in 2016 and have seen it change for the better. Wealthy Affiliate is not perfect but the owners are always committed to making it better for everyone involved. They invest millions per year on the platform without increasing the membership cost, which really amazes me! Another thing I love about Wealthy Affiliate is that the success stories are real. They’re written by real people who have followed the WA training and earned real money! It shows that, if you’re committed to putting in the work and time, you end up reaping the rewards. Sarah has been a Wealthy Affiliate member since 2015 and she earned her first real income in July 2017. She is a make up artist and has a YouTube channel, which I personally follow because I find her makeups awesome! 🙂 You can click on the picture below to read the full story. 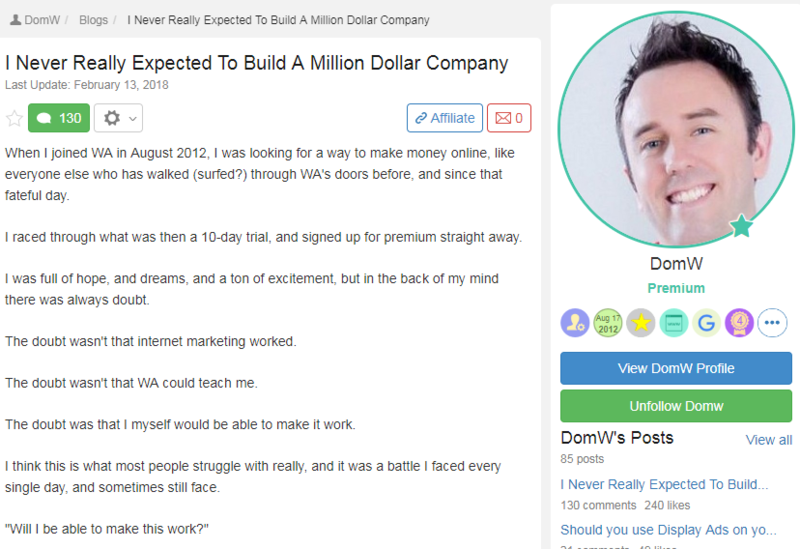 Dom is a very successful Internet entrepreneur who joined Wealthy Affiliate in 2012 and has built a million dollar company. In this blog post he talks about his experience and the lessons he’s learned along the way. You can read the full story by clicking on the picture below. You can read the whole story by clicking the image below. 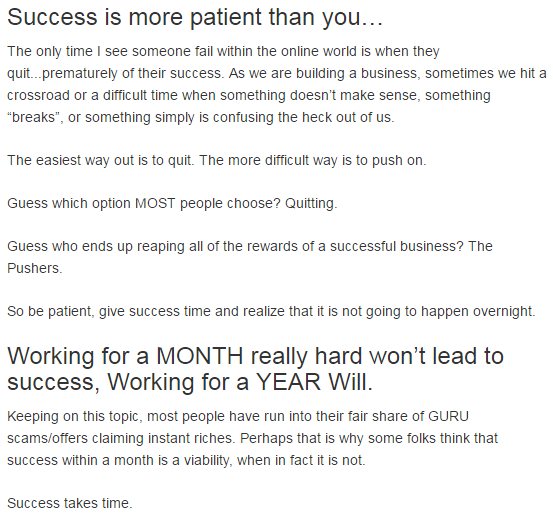 There are hundreds of success stories, I would never finish this guide if I posted them all lol. This is proof that what is taught at Wealthy Affiliate works! Can I Earn Money As A Free Starter Member? Yes, it’s not impossible to earn money a free member, but it’s much more complicated to achieve success without upgrading to Premium, in my opinion. I know it would be amazing if everything was free, but if you think about it, giving everything away for free is not sustainable for anyone because we all have bills to pay. As I said earlier, you can get started for free which is a big benefit to decide if this is for you. If you compare it to a traditional business, this is so much cheaper and the earning potential is just as high. There are many factors to take into consideration when it comes to how long it takes to start making money. For people who already have some experience, it takes less than it takes to beginners. If I had to give you a specific answer, I would say it takes between 3 and 6 months to start seeing the first sales, taking into account that you follow Wealthy Affiliate’s training and apply what you learn on a daily basis. This takes a lot of patience, persistence and perseverance because success doesn’t happen in a short amount of time. 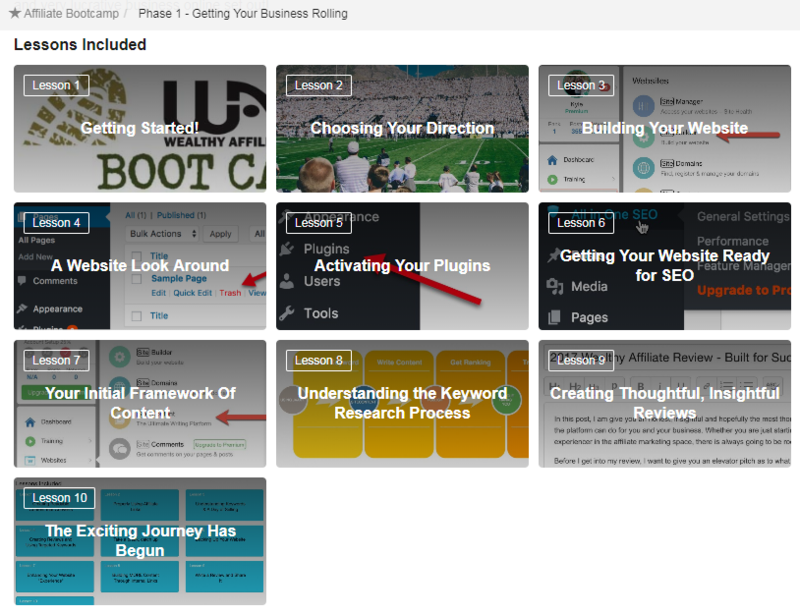 Setting up a website, creating quality content and getting it ranked takes time and effort. When you first get started, it might seem like you’re working for nothing but it’s normal, this is something we all have been through. There are other people who make their first sales within 1 or 2 months, but these are usually people who have some experience. And when it comes to people who have limited time or resources, it takes more than a year for them to start earning money. If you’re someone who needs to make money immediately, then this is not for you. If you’re someone who wants to earn passive income online or wants to achieve financial freedom and have the “laptop lifestyle”, then this is for you. As long as you are willing to learn and take action, Wealthy Affiliate is for you. You don’t need to recruit other people into the platform to make money. The training teaches you to build an affiliate marketing in any niche. Even though you can take part in the Wealthy Affiliate’s Affiliate Program, you don’t earn commissions from the sales of your referrals. Can I Build This Business If I Have A Full-Time Job? Yes. In fact, many people start by putting in a few hours per week until they can quit their jobs. I know it takes more time to build your business when you have a job, but it’s definitely worth it in the long-term. The more time and effort you put into your business, the sooner you will be earning passive income and have more freedom. In case you have any more questions, I suggest that you create a FREE account at Wealthy Affiliate and reach out to me inside. You can write me a message on my profile anytime and I will get back to you as soon as possible! Complete your account set up by adding an image and a description of yourself on your profile. 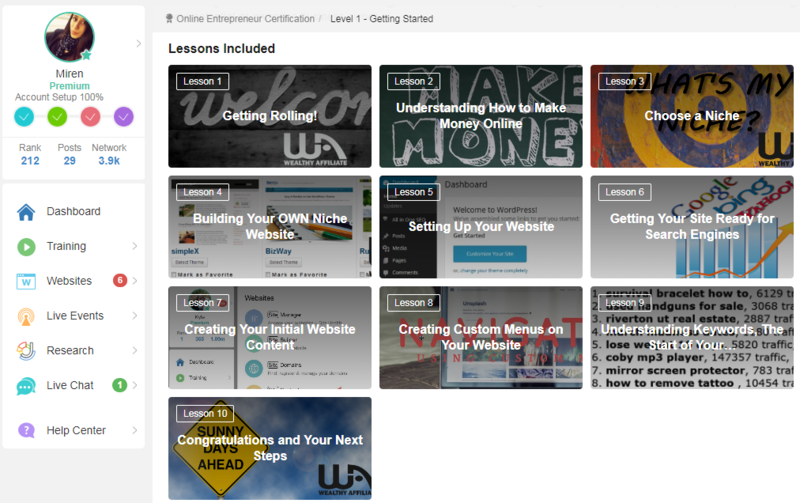 Start the Online Entrepreneur Certification course. Write me a message if you have any questions.